On November 10, 1775, the Second Continental Congress meeting in Philadelphia passed a resolution stating that "two Battalions of Marines be raised" for service as landing forces with the fleet. This resolution established the Continental Marines and marked the birth date of the United States Marine Corps. Serving on land and at sea, these first Marines distinguished themselves in a number of important operations, including their first amphibious raid into the Bahamas in March 1776, under the command of Captain (later Major) Samuel Nicholas. The first commissioned officer in the Continental Marines, Nicholas remained the senior Marine officer throughout the American Revolution and is considered to be the first Marine Commandant. The Treaty of Paris in April 1783 brought an end to the Revolutionary War and as the last of the Navy's ships were sold, the Continental Navy and Marines went out of existence. 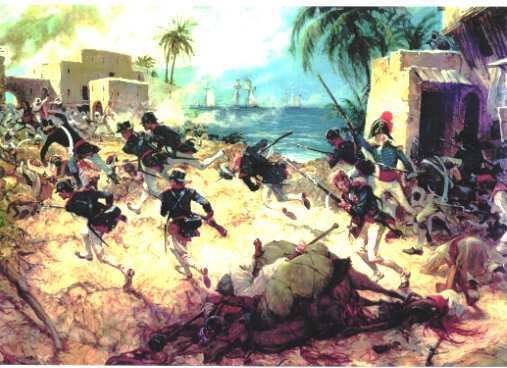 Following the Revolutionary War and the formal re-establishment of the Marine Corps on 11 July 1798, Marines saw action in the quasi-war with France, landed in Santo Domingo, and took part in many operations against the Barbary pirates along the "Shores of Tripoli". Marines took part in numerous naval operations during the War of 1812, as well as participating in the defense of Washington at Bladensburg, Maryland, and fought alongside Andrew Jackson in the defeat of the British at New Orleans. The decades following the War of 1812 saw the Marines protecting American interests around the world, in the Caribbean, at the Falkland Islands, Sumatra and off the coast of West Africa, and also close to home in operations against the Seminole Indians in Florida. During the Mexican War (1846-1848), Marines seized enemy seaports on both the Gulf and Pacific coasts. A battalion of Marines joined General Winfield Scott's army at Pueblo and fought all the way to the "Halls of Montezuma,", Mexico City. Marines also served ashore and afloat in the Civil War (1861-1865). Although most service was with the Navy, a battalion fought at Bull Run and other units saw action with the blockading squadrons and at Cape Hatteras, New Orleans, Charleston, and Fort Fisher. The last third of the 19th century saw Marines making numerous landings throughout the world, especially in the Orient and in the Caribbean area. Following the Spanish-American War (1898), in which Marines performed with valor in Cuba, Puerto Rico, Guam, and the Philippines, the Corps entered an era of expansion and professional development. It saw active service in the Philippine Insurrection (1899-1902), the Boxer Rebellion in China (1900). and in numerous other nations, including Nicaragua, Panama, Cuba, Mexico, and Haiti. In World War I the Marine Corps distinguished itself on the battlefields of France as the 4th Marine Brigade earned the title of "Devil Dogs" for heroic action during 1918 at Belleau Wood, Soissons, St. Michiel, Blanc Mont, and in the final Meuse-Argonne offensive. Marine aviation, which dates from 1912, also played a part in the war effort, as Marine pilots flew day bomber missions over France and Belgium. More than 30,000 Marines served in France and more than a third were killed or wounded in six months of intense fighting. During the two decades before World War II, the Marine Corps began to develop in earnest the doctrine, equipment, and organization needed for amphibious warfare. The success of this effort was proven first on Guadalcanal, then on Bougainville, Tarawa, New Britain, Kwajalein, Eniwetok, Saipan, Guam, Tinian, Peleliu, Iwo Jima and Okinawa. By the end of the war in 1945, the Marine Corps had grown to include six divisions, five air wings, and supporting troops. Its strength in World War II peaked at 485,113. The war cost the Marines nearly 87,000 dead and wounded, and 82 Marines had earned the Medal of Honor. While Marine units took part in the post-war occupation of Japan and North China, studies were undertaken at Quantico, Virginia, which concentrated on attaining a "vertical envelopment" capability for the Corps through the use of helicopters. Landing at Inchon, Korea in September 1950, Marines proved that the doctrine of amphibious assault was still viable and necessary. After the recapture of Seoul, the Marines advanced to the Chosin Reservoir only to see the Chinese Communists enter the war. After years of offensives, counter-offensives, seemingly endless trench warfare, and occupation duty, the last Marine ground troops were withdrawn in March 1955. More than 25,000 Marines were killed or wounded during the Korean War. In July 1958, a brigade-size force landed in Lebanon to restore order. During the Cuban Missile Crisis in October 1962, a large amphibious force was marshaled but not landed. In April 1965, a brigade of Marines landed in the Dominican Republic to protect Americans and evacuate those who wished to leave. The landing of the 9th Marine Expeditionary Brigade at Da Nang in 1965 marked the beginning of large-scale Marine involvement in Vietnam. By summer 1968, after the enemy's Tet Offensive, Marine Corps strength in Vietnam rose to a peak of approximately 85,000. The Marine withdrawal began in 1969 as the South Vietnamese began to assume a larger role in the fighting; the last Marine ground forces were out of Vietnam by June 1971. The Vietnam War, longest in the history of the Marine Corps, exacted a high cost as well with over 13,000 Marines killed and more than 88,000 wounded. In the spring of 1975, Marines evacuated embassy staffs, American citizens, and refugees in Phnom Penh, Cambodia, and Saigon, Republic of Vietnam. In May, Marines played an integral role in the rescue of the crew of the SS Mayaguez captured off the coast of Cambodia. The mid-1970s saw the Marine Corps assume an increasingly significant role in defending NATO's northern flank as amphibious units of the 2d Marine Division participated in exercises throughout northern Europe. The Marine Corps also played a key role in the development of the Rapid Deployment Force, a multi-service organization created to insure a flexible, timely military response around the world when needed. The Maritime Prepositioning Ships (MPS) concept was developed to enhance this capability by prestaging equipment needed for combat in the vicinity of the designated area of operations, and reduce response time as Marines travel by air to link up with MPS assets. The 1980s brought an increasing number of terrorist attacks on U.S. embassies around the world. Marine Security Guards, under the direction of the State Department, continued to serve with distinction in the face of this challenge. In August 1982, Marine units landed at Beirut, Lebanon, as part of the multi-national peace-keeping force. For the next 19 months these units faced the hazards of their mission with courage and professionalism. In October 1983, Marines took part in the highly successful, short-notice intervention in Grenada. As the decade of the 1980s came to a close, Marines were summoned to respond to instability in Central America. Operation Just Cause was launched in Panama in December 1989 to protect American lives and restore the democratic process in that nation. Less than a year later, in August 1990, the Iraqi invasion of Kuwait set in motion events that would lead to the largest movement of Marine Corps forces since World War II. Between August 1990 and January 1991, some 24 infantry battalions, 40 squadrons, and more than 92,000 Marines deployed to the Persian Gulf as part of Operation Desert Shield. Operation Desert Storm was launched 16 January 1991, the day the air campaign began. The main attack came overland beginning 24 February when the 1st and 2d Marine Divisions breached the Iraqi defense lines and stormed into occupied Kuwait. By the morning of February 28, 100 hours after the ground war began, almost the entire Iraqi Army in the Kuwaiti theater of operations had been encircled, with 4,000 tanks destroyed and 42 divisions destroyed or rendered ineffective. Overshadowed by the events in the Persian Gulf during 1990-91, were a number of other significant Marine deployments demonstrating the Corps' flexible and rapid response. Included among these were non-combatant evacuation operations in Liberia and Somalia and humanitarian lifesaving operations in Bangladesh, the Philippines, and northern Iraq. In December 1992, Marines landed in Somalia marking the beginning of a two-year humanitarian relief operation in that famine-stricken and strife-torn nation. In another part of the world, Marine Corps aircraft supported Operation Deny Flight in the no-fly zone over Bosnia-Herzegovina. During April 1994, Marines once again demonstrated their ability to protect American citizens in remote parts of the world when a Marine task force evacuated U.S. citizens from Rwanda in response to civil unrest in that country. Closer to home, Marines went ashore in September 1994 in Haiti as part of the U.S. force participating in the restoration of democracy in that country. During this same period Marines were actively engaged in providing assistance to the Nation's counter-drug effort, assisting in battling wild fires in the western United States, and aiding in flood and hurricane relief operations. The Marine Corps continued its tradition of innovation to meet the challenges of a new century. The Marine Corps Warfighting Laboratory was created in 1995 to evaluate change, assess the impact of new technologies on warfighting, and expedite the introduction of new capabilities into the operating forces of the Marine Corps. Exercises such as "Hunter Warrior," and "Urban Warrior" were designed to explore future tactical concepts, and to examine facets of military operations in urban environments. During the late 1990's, Marine Corps units deployed to several African nations, including Liberia, the Central African Republic, Zaire, and Eritrea, in order to provide security and assist in the evacuation of American citizens during periods of political and civil instability in those nations. Humanitarian and disaster relief operations were also conducted by Marines during 1998 in Kenya, and in the Central American nations of Honduras, Nicaragua, El Salvador, and Guatemala. In 1999, Marine units deployed to Kosovo in support of Operation Allied Force. Soon after the September 2001 terrorist attacks on New York City and Washington, D.C., Marine units deployed to the Arabian Sea and in November set up a forward operating base in southern Afghanistan as part of Operation Enduring Freedom. In 2002, the Marine Corps continued to play a key role in the Global War on Terrorism. Marines operated in diverse locations, from Afghanistan, to the Arabian Gulf, to the Horn of Africa and the Philippines. Early 2003 saw the largest deployment of Marine forces since the Persian Gulf War of 1990-91 when 76,000 Marines deployed to the Central Command area for combat operations against Iraq. The I Marine Expeditionary Force, including Task Force Tarawa and the United Kingdom�s 1st Armored Division, were the first conventional ground units to enter Iraq in late March as part of Operation Iraqi Freedom. Fixed-wing and helicopter aircraft from the 3d Marine Air Wing provided continuous close air and assault support to Marine and coalition units as they drove deeper into Iraq. On the ground, Marines from I MEF moved nearly 400 miles from the Kuwait border to Baghdad and Tikrit, Iraq, and eliminated the last organized resistance by Iraqi military forces. Although I MEF would transition to stabilization and security operations and then redeploy to the U.S. by late September, I MEF began preparing for a return to Iraq in early 2004. The adaptability and reliability of Marine forces continued to be highlighted around the world from the Horn of Africa to Haiti and to the Philippines. Across the U.S., Marine units from both coasts fought and contained wildfires, and also supported hurricane relief efforts in various parts of the country. In December, 2004, a tsunami struck numerous nations in the Indian Ocean region killing more than 150,000 and causing enormous devastation. Marine units from III MEF were immediately deployed to Thailand, Indonesia, and Sri Lanka to assist in disaster relief operations. In early 2005, the II Marine Expeditionary Force replaced I MEF in Iraq as the primary focus began to shift to partnership operations with the Iraqi Security Forces. Marine units continued to provide air and ground support to Operation Enduring Freedom in Afghanistan. Closer to home, the flexibility and responsiveness of the Navy/Marine team was exhibited during September and October when nearly 3000 Marines and sailors conducted search and rescue, humanitarian relief, and disaster recovery operations in Louisiana and Mississippi in the aftermath of hurricanes Katrina and Rita. Today's Marine Corps stands ready to continue in the proud tradition of those who so valiantly fought and died at Belleau Wood, Iwo Jima, the Chosin Reservoir, and Khe Sanh. Combining a long and proud heritage of faithful service to the nation, with the resolve to face tomorrow's challenges will continue to keep the Marine Corps the "best of the best."